MUNCIE, Ind. (CNS) — When four graduate students at Ball State University took on an awareness campaign, they hoped it would have a global reach. Then, a global institution reached back. That “major iconic hub” was the Vatican. The four students, all of whom are earning master’s degrees in emerging media design and development, along with their professor and another Ball State staff member, assisted traveled to Rome to assist with a March 21-23 conference in Rome sponsored by the Pontifical Council for Culture and the Club of Rome. Titled “Watershed: Replenishing Water Values for a Thirsty World,” the Rome conference drew about 400 policymakers, academics, business leaders and grass-roots advocates. “Day two of the conference was streamed on Facebook Live and at one point we reached 30,000 views,” said Briee Eikenberry, the project’s producer, referring to the number of people who were watching the event live through the social media platform. When the young women originally began their water-awareness campaign, christened the Blue Roots Project — bluerootsproject.org — no one expected it would take them to the Vatican. It started as a collaboration to help Circle of Blue, a research and communications hub that focuses on water-related problems and advances. However, as the Ball State project gained momentum, Circle of Blue suggested that the students should be part of Rome’s “Watershed” conference. 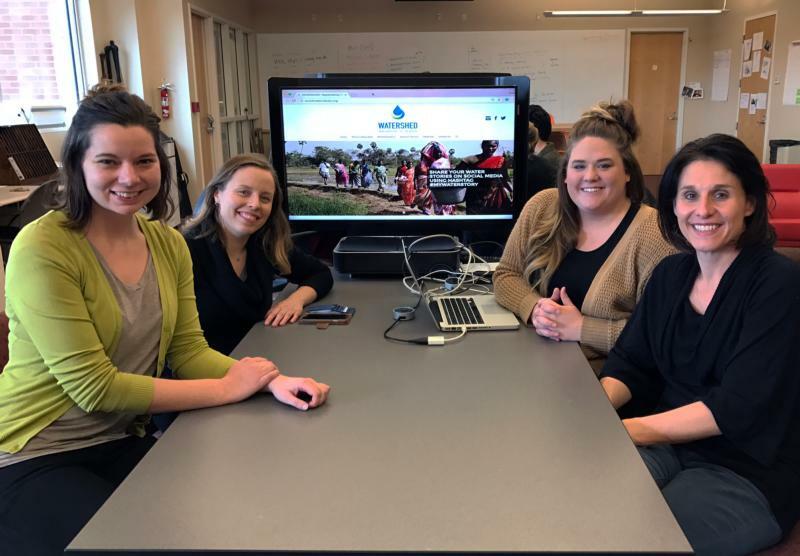 After the Vatican learned of the students’ work, which included a website and global social media outreach, the four were asked to create the official website for the Watershed event and to assist with social media for the event itself. The Ball State team wants to continue spreading water consciousness to leaders and the public alike, engaging everyone in a conversation about water that they began with the Blue Roots Project and bolstered through the “Watershed” conference. “I think that it will be our responsibility, not just my students and I, but the responsibility of everyone who attended the summit to continue to work together, to continue to work with the Vatican and Pope Francis to spread this important story,” explained Palilonis. The core of the Blue Roots Project is the social media hashtag #MyWaterStory. The students ask groups and individuals to share their own experiences with water on social media and mark those with the hashtag. The team then gathers and shares the stories, hoping that participants from more privileged societies will see the difficulties that others have with regard to water. The team also hopes to reverse the disregard they say many of their fellow Americans have for the value of water. Jessica Pettengill, the project’s research strategist and media producer, recalled the severe drought that gripped her home state of California three years ago. “It was insane to me that even though we were going through this drought and the governor had declared a state of emergency, people were still watering their lawns twice a week,” she said. Another team member, Sarah Janssen, is trying to bring home the importance of water by highlighting a crisis that happened just a state away. She designed a personal project to collect and share the stories of the residents of Flint, Michigan, who were afflicted by lead-contaminated water last year. Ailments caused by this poisoning will affect some local residents for the rest of their lives. Janssen believes that just sympathizing with those who are suffering is a step on the road to a better world. She hopes that the campaign will generate a flood of support for Flint and for all areas suffering similar crises.